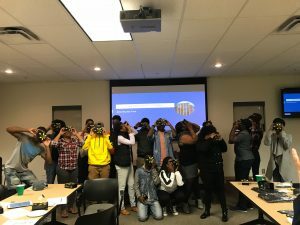 The following post was written by Haley Nelson, an attendee of an AIAS West Workshop who happily provided us with a thorough review of what ended up being a surprising and welcome foray into technology, as she puts it “of the future”. Thanks to a summer internship that used ARCHICAD exclusively, I had become “conversational” in ARCHICAD and had since made it my go-to drafting software for my graduate architecture studies at the University of Oregon. Having attended software workshops in the past, I recalled how common it was for workshop leaders to emphasize the ways in which their software could nurture and elevate the creative process, touting features such as “parametric design compatibility” and “top-of-the-line 3D rendering”. 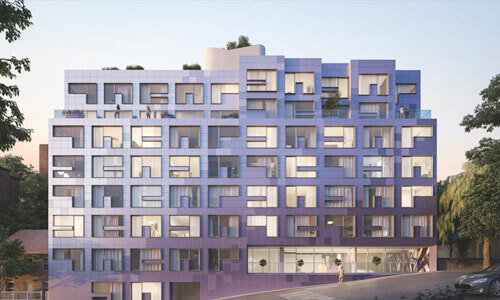 My expectations of the ARCHICAD Workshop included receiving a broad-strokes tour of the drafting software, common to these types of student-targeted conferences, possibly picking up new keyboard shortcuts, or a faster way to create a topographic mesh grid. I yearned for the science! For the data! Prior to my architecture studies, I had completed a B.S. in physics, which made a formative impact on my approach to design. My process consequently tends to start with parameters such as wall thermodynamics, energy consumption, soil chemistry, optical performance of the lighting scheme, geography of the site, structural integrity of the materials, and so on. In my mind, a beautiful, functional design lies dormant in a rich garden of objective data, and it is up to designers to root it out through the artful combination of scientific research and a creatively-analytical mind. I settled into a seat, anticipating a basic review session. Instead, I was greeted warmly by three workshop leaders — Lauren Allsopp, Professor of Historic Preservation at the University of Oregon; Philip Allsopp, Senior Sustainability Scientist at the Julie Ann Wrigley Global Institute of Sustainability and President of the US division of the British Society of Architects; and Paul Tice, Founder and Chief Experience Officer of Topa3D — professional heavyweights with resumes so impressive, it was difficult to believe they had been asked to lead a simple drafting software workshop. And indeed, as I quickly came to find out, the true topic of the workshop was far more broad-scope and forward-thinking than I had expected. Much to my surprise, this amazing team of specialists decided to abandon their planned presentation and give me a one-on-one tour of the incredible technological advances in drafting tools and software, and their potential to improve the future of architectural design practice. The workshop kicked off with a bang! 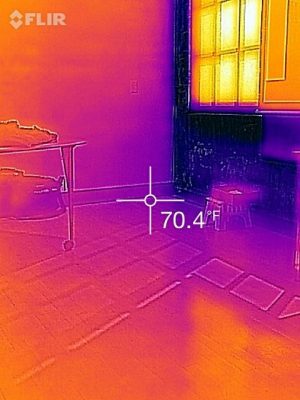 Infrared Imaging was first up. The team excitedly set up a showcase of products, including a thermal imaging scanner, which look and operate similarly to panoramic cameras, scanning rooms and storing data spatially, and the “Lauren Allsopp-approved” FLIR brand thermal camera which connects directly to your smartphone for taking “on-the-go” IR images. 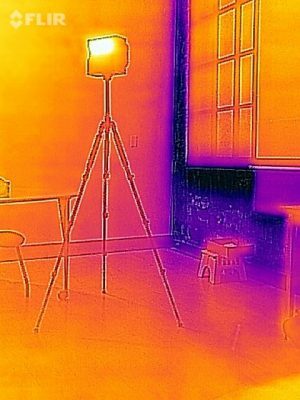 Such devices can be incredibly helpful in illustrating the “thermal breakdown” of a space, which for designers, can mean detecting thermal bridging, areas experiencing significant infiltration, or gathering a basic sense of thermal comfort within the space. 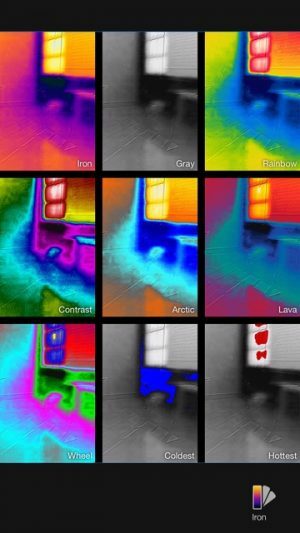 Already, IR imaging has played an important role in evaluating the thermal and ventilation efficiency of existing spaces, but the potential to apply the data gleaned from IR imaging goes beyond assessing buildings which already exist: IR photos can provide evidence to support or discourage certain design choices as they relate to heat transfer, and improve our understanding of energy efficiency in the built world by connecting measurements of thermal performance with energy consumption and cost. Next up was a tour of Paul Tice’s wheelhouse, the wide world of LiDAR, or Light Detection and Ranging technologies. By emitting regular laser pulses around a space, LiDAR devices can measure and record three-dimensional spatial layouts — more technically, the distance measurement recorded from each laser pulse is stored as a coordinate point, belonging to a greater three-dimensional “point cloud”. While LiDAR technology alone deserves acclaim, it is the virtually limitless application of the point cloud that makes LiDAR technology so valuable and exciting for designers! Already, professionals in a variety of fields have found ways to employ LiDAR technology, often in conjunction with a camera, such that point cloud information can be linked to an image counterpart, and rendered digitally in 3D. The implications for architecture and design are apparent, as my three workshop tutors have already discovered. The 3D rendering potential of the LiDAR+camera+ARCHICAD combination was demonstrated through examples ranging from topographic surface rendering, capturing and digitally-recreating historic buildings, to the detection of facade deterioration at the millimeter scale! Such precision in three-dimensional space has direct benefits for design and design research, with the ability to manipulate point clouds exponentially increasing application potential! Not to mention, given that LiDAR produces point clouds with incredible speed and accuracy, professional time spent rendering existing buildings can be cut by an order of magnitude at least! The workshop concluded with a discussion of the trajectory of architectural practice, as it relates to emerging software and technology. It’s clear that the future of architecture lies in its ability to learn from the past, apply what it has learned in the present, and remain relevant and flexible in the face of an uncertain future. Already, there are countless methods, tools, technologies, and practices available to architects and designers to discover new and improved design solutions, but as most modern professions realize, the more technological progress that can be made, the better. The workshop I attended represented a snapshot of such progress, providing evidence that architecture and design have more at their disposal than they might realize. Beyond this, though, the presenters underscored the importance of valuing such technological potential, and actively working to incorporate it into design practices and processes. To dismiss the ever-growing body of scientific knowledge and the technology that uncovers it, and failing to contribute back to it, diminishes the potential of architecture and design to inject good into our world. It is why, as my workshop hosts emphasized, embracing new technology and becoming fluent in its language is imperative for the advancement of design disciplines. In short, if we take every opportunity to understand the nuanced complexity of our field, we will be prepared to meet the design challenges of our future. I will certainly not forget the lessons and groundbreaking technologies shared by my gracious workshop educators, and intend to incorporate what I’ve learned right away! Thankfully, I am already well-positioned as a loyal ARCHICAD user to adopt the new technologies and practices that may enhance my life as an architectural scientist. I look forward to exploring, with assistance from GRAPHISOFT, the endless data stream that lies in wait.